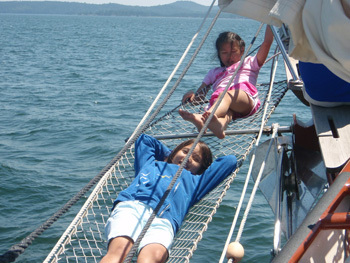 VIP Queen + Upper/Lower Twin Bunk Bed Cabin + Lower Twin Cabin - 2 guest bathrooms with showers. One bed in each of the Twin cabins pulls out to a Double. 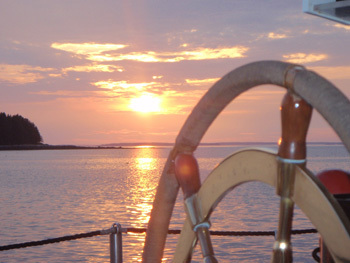 Come sail the pristine coast of Maine with adventurers Bonnie and Earl MacKenzie aboard their beautiful, classic, 72′ schooner BONNIE LYNN. 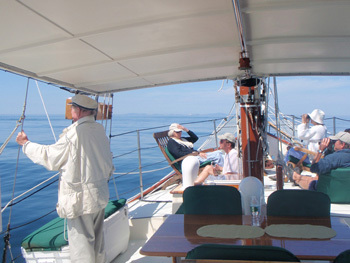 Available out of Camden, Maine, she offers elegant appointments with fine crew in a gorgeous part of the world for private parties up to six guests. 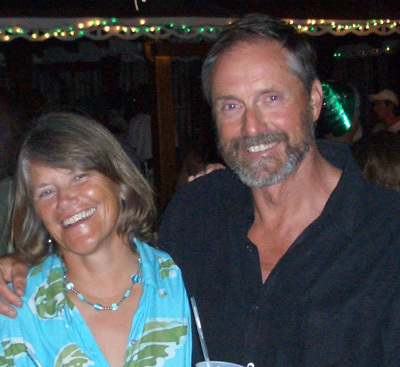 Choose your own dates; Earl knows the coast of Maine like the back of his hand; Bonnie takes care of all the meals. 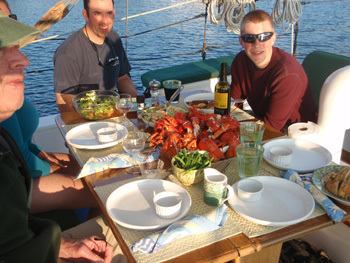 Sail, kayak, snorkel, explore Penobscot Bay and environs. 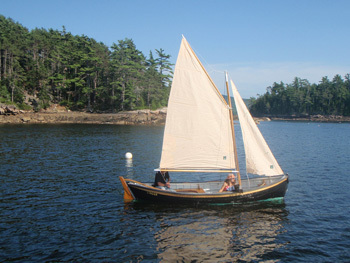 Bonnie Lynn is one of the most unique of the Maine Schooner Fleet. 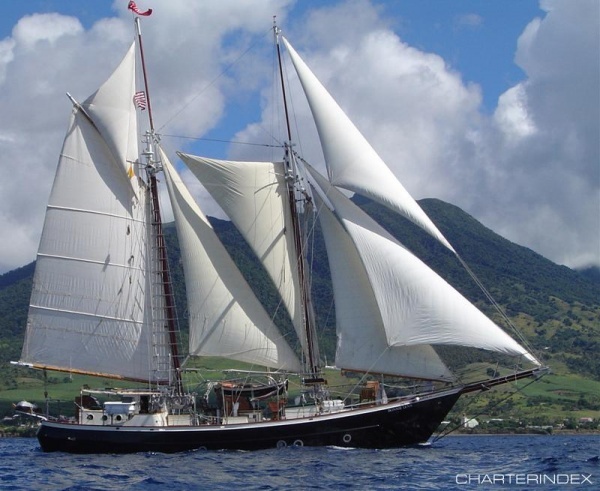 She is a modified version of designer Merrit Walter’s Trade Rover Schooner. 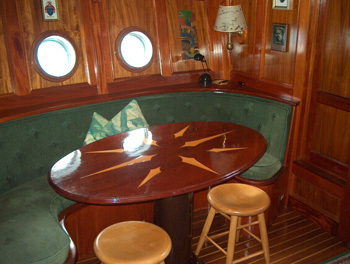 Being a serious offshore cruising vessel, she is built to very high standards. 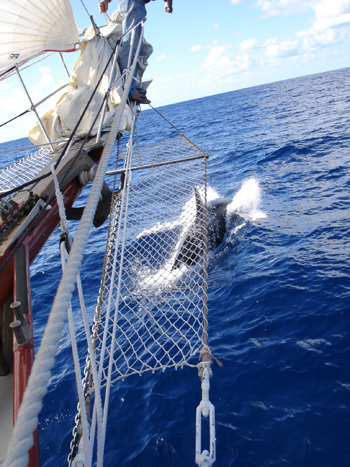 The steel hull is 57’ on deck, with an overall length of 72’. She has a 15’3″ beam and 6’6″ draft. 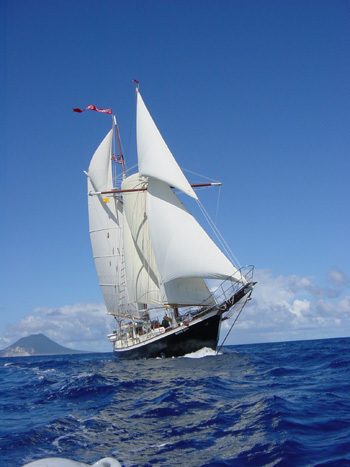 Bonnie Lynn is a gaff rigged topsail schooner, having three head sails and a traditional square fore topsail. Evoking images of a bygone era. She is U.S. Coast Guard Certified for 38 passengers coastal and 10-ocean sailing. 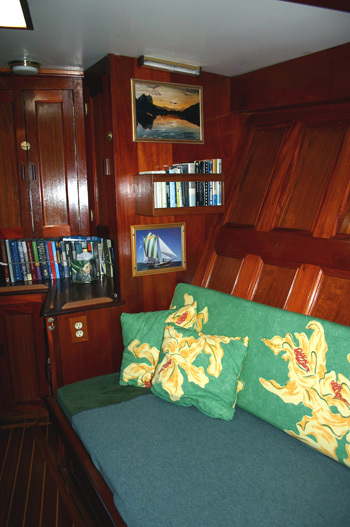 The yacht and crew, her owners Earl and Bonnie are well known in the charter industry, having been based in the Lower Caribbean as a sole agency Nicholson yacht…. 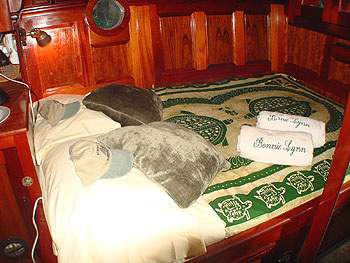 Let’s see….how many groups have we arranged charters for aboard Bonnie Lynn? A lot! 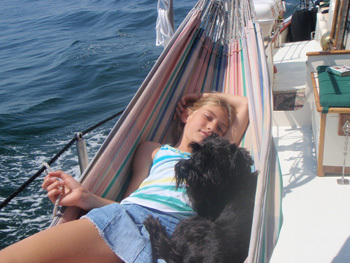 She is one of our director, Julie Nicholson’s favorites yachts. 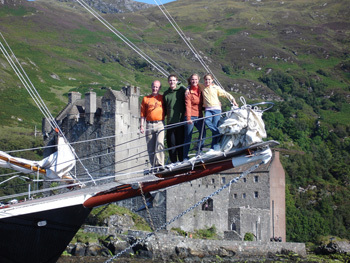 Crew is important to her, and Earl and Bonnie are fine people, adventurers, who seek out off-the-beaten-track places to visit and explore. 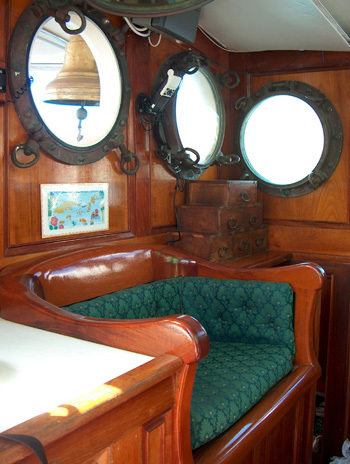 BONNIE LYNN’s fully air conditioned interior of teak & mahogany paneling and traditional brass fixtures truly combines modern comforts with old world charm. 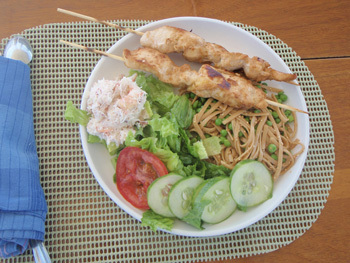 BONNIE LYYN offers comfortable accommodations for up to 6 guests and is ideal for couples or families alike. 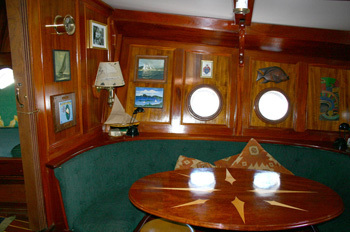 Three spacious guest cabins and two adjoining guest heads & showers are located in the private, forward area with crew cabin and head/shower located aft. 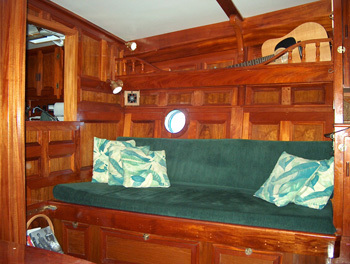 A starboard guest cabin has double bed and a port guest cabin has a double bed which can convert to single bed with day couch. 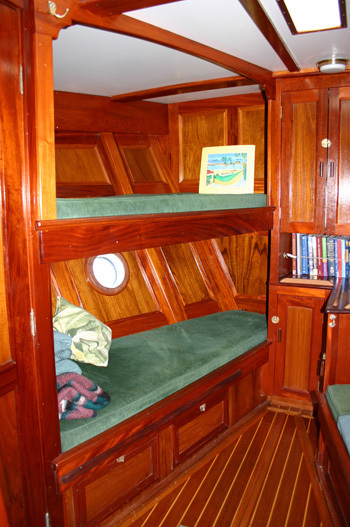 The forward guest cabin has a starboard bunk that pulls out to a large double and to port a lower single & small upper double.